JetChester sprayers from HARDI Australia are ideal for those who are working on country that is too rough to spray with a boom. To put it simply, they minimise the chance of the boom off by falling in a hole, covered by the grass. JetChester sprayers are boom-less and they spray as wide as a boom but without the structure. JetChester sprayers provide a 10m wide coverage in good conditions and need 25 Ll/m at 3 bar pressure to perform. 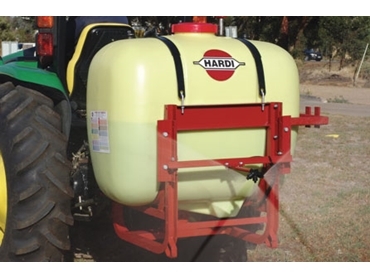 Hardi JetChester sprayers are ideal for a PTO drive linkage sprayer on a tractor, or even an engine-drive pick-up sprayer on the back of the Ute.